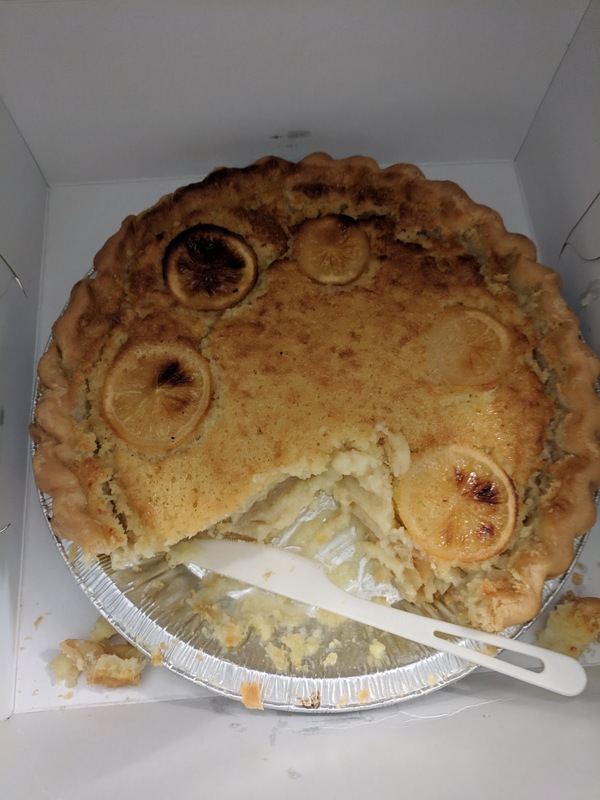 You know it is a good day in the office when you walk by and find boxes of pie in the mini kitchen. I haven't loved Chile Pies in the past, but of course I was willing to give these a try. And ... and found a winner! 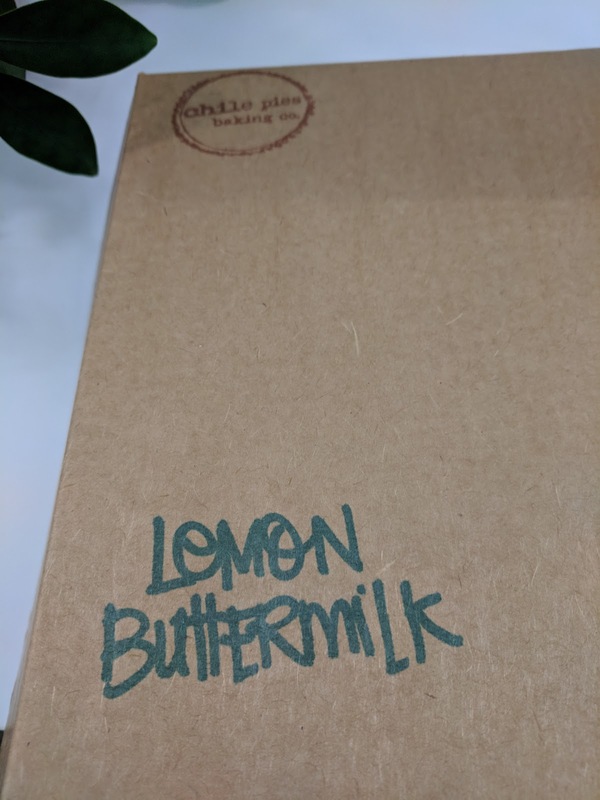 The first pie was lemon buttermilk. I don't really care for lemon (or orange, or lime, or any citrus) desserts in general, so my first instinct was to move right on, but, then I remembered the Lemon Shaker Pie from Mission Pie that I adored, and decided to give it a chance, and cut a tiny slice. I loved it. Really, really loved it. And immediately took a *very* generous serving. The filling was a tangy, creamy, lemon custard. It reminded me in texture to the filling of a pecan pie (the custard layer, not the pecans obviously), but not cloyingly sweet. It was tart and bright, and really quite enjoyable. On top was slices of candied lemons, which added a decorative element, and a bit of texture. The crust was also fantastic. Flaky, light, perfectly cooked buttery crust. Mmm, all butter crust. I really enjoyed this pie, particularly with a dollop of whipped cream. I think it would be great with a bit of raspberry puree as well. 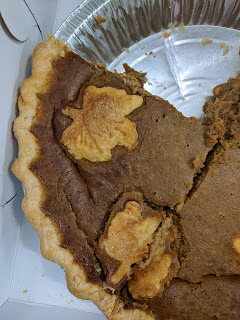 Next was pumpkin, which I dove right for, as I do generally love pumpkin pie. After a disappointing dinner that failed to include dessert, I was left seriously unsatisfied. I wanted something to make me happy. And what is more comforting than a warm slice of pie a la mode? (At least for me, I grew up eating a lot of pie, so this is really just a total comfort food for me, not a rare special occasion sort of thing). 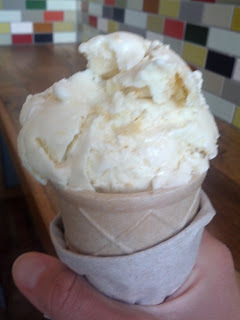 I'd been to the Chili Pies and Ice Cream in NOPA once before. I didn't love it then, but I knew there was a location in the Mission a few blocks from where we were, so it seemed worth checking out. 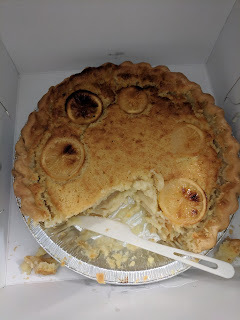 Like the other location, they offer up a variety of sweet pies (as well as savory ones), including some fruit pies, a few chocolately pies, and on weekends only apparently, some cream pies. They'll heat them up and serve them a la mode, with your choice of ice cream from Three Twins. There is a decent selection of both pie types and ice cream flavors. You can also just get a cup or cone of ice cream, or if you are feeling adventurous, a "pie shake", where they blend up a slice of pie, a scoop of ice cream, and milk, into a shake, full of chunks of pie, and top it with whipped cream. This actually sounds pretty good, in a crazy decadent sort of way, to me, and I'd still like to try it out sometime. I'm not a huge fan of Three Twins. I don't actively dislike the ice cream, but it hasn't ever impressed me. I tried three more flavors today, and still feel the same way. Last time I visited, I sampled the signature pie: the green chile apple pie with a cheddar crust and walnut streusel. It was ok, but the chili flavor was pretty strong and I felt like it dominated the whole thing. I grew up having warm apple pie with cheddar cheese melted on top though, so the idea of the cheddar crust was really appealing (like the warm apple pie with cheddar ice cream at Spruce!). Last time I was there, I settled on the country peach pie. My memory (and tasting notes which I just found) said that the crust was delicious, the nut streusel topping was amazing, and the filling was kinda just meh. I recall visiting when peaches weren't in season though, so thought it might have been my own fault that I picked one without a very good filling. Strawberry-rhubarb pie, Three Twins lemon-cookie ice cream. $9.50. I had assumed this would be just like the peach pie - great crust, awesome stressel, and hopefully, since they are starting to be in season, delicious strawberry filling. I was wrong. The crust was not very good at all. Crisp, crumbly, no flavor to it at all. Not buttery, not sweet, just there. The crumble topping was equally tasteless, and definitely not the nutty, sweet delicious one from the peach pie. And the filling was really over-floured, mushy, with a bad mouthfeel. There was far more rhubarb than strawberry, and I don't actually care for rhubarb, so this sort of ruined it for me (I wouldn't normally pick something with rhubarb, but the other strawberry pie was vegan, so I assumed that one would be less tasty, and the other fruit pies weren't in season fruits ...). It was also served kinda as a jumble like this. No presentation points here! I do like that they warm it up, but it was more lukewarm than warm. The ice cream was the best part, but I didn't particularly like it either. You can see my tasting notes of that on my Three Twins review page. I kinda doubt I'll be going back here, although I could be convinced if someone would want to go try a pie shake with me! My opinion of the place remains unchanged. I just don't care for their pies, and don't like most of Three Twins flavors, although the Lemon Cookie ice cream is pretty good. I really want to like this place more than I do, as I love pies, and they do look so good. I'm glad I got a chance to try it again though, and my ice cream cone was really quite enjoyable on the hot sunny Mission afternoon! Single cone of Lemon Cookie Ice Cream. $2.50. My Three Twins review page has all the details on the ice cream, so I'll keep this brief. Lemon Cookie is the best flavor I've tried from Three Twins, by far. I love the balance of the tart lemon flavor and the sweetness of the ice cream, and the texture added by the cookies. $2.50 seems like a decent price for a cone these days. I actually really liked the cake cone, it didn't seem like the same generic cardboard like Joy cup, and instead had a nicer crunch to it. Mexican Chocolate Pecan Pie: I was super excited to see samples of this, as it is one I've always wanted to order. Unfortunately, it just didn't seem like much. I didn't detect anything "mexican" about it, I was assuming that would be some spicing? It was kinda just mushy, sweet, but flavorless. 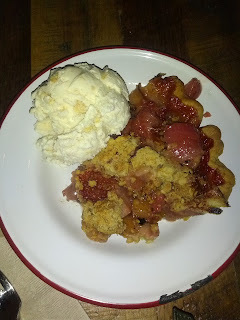 Strawberry-Apple Pie: I think this one may have been vegan. It reminded me of the strawberry-rhubarb pie I'd had before, mostly just mushy fruit. Neither the crust nor the streusel topping were very good. Sigh. Chicken and Greens Salad: I had no idea they served salads! I knew they had savory pies, but salads? Hmm. Anyway, I don't really like chicken, so this wasn't very interesting to me. It ... tasted like chicken?